Baker Perkins has further invested in its product and process development capability for the snack industry. A new SBX Master™ twin-screw extruder installed in its Innovation Centre widens the selection of potential applications and end product options. The new extruder, with a 250 kg/hour maximum capacity, is ideal for both short runs for initial development purposes, and longer runs to optimize a process and confirm its stability and product quality. Customers from around the world visit the Innovation Centre at Peterborough, UK for a variety of purposes. Creative original ideas for snack products are explored; processes developed and proven in co-operation with Baker Perkins process technologists. As well as product development, customers use Innovation Centre facilities to evaluate a wide range of process technologies for existing products. This could, for example, be converting snacks made with a single-screw extruder, to continuous twin-screw operation. Potential benefits include the choice of a wider range of ingredients, greater throughput, improved quality and added flexibility. Companies find that thorough trials, often using their own raw materials, provide a reliable basis for trouble-free commissioning of new plant or the launch of a new product. The Innovation Centre is used by customers from all regions of the world who develop high quality end products for their respective marketplaces. It is a secure environment where visitors are assured of total confidentiality. The new extruder can be run in standard or extended-barrel mode, which allows a wider selection of process options including a longer cooking time. Direct expanded, face cut, extruded and formed, and co-extruded products can be made. The Innovation Centre also contains facilities for downstream snack processes including drying, toasting, frying, baking, coating and flavouring. The Baker Perkins SBX Master™ twin-screw extruder is available in a range of outputs between 250 and 2,300 kg/hour of snacks. 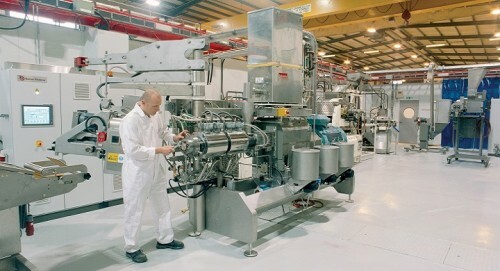 It is the basis for extrusion systems making standard direct expanded snacks. The Baker Perkins modular Snack Master™ concept means that as a business develops, a line may be extended in stages to broaden the range of products that can be made.